A statue of Sen. Richard Russell stands in the rotunda of a Senate office building named after him. Senate Minority Leader Chuck Schumer proposed honoring the late Sen. John McCain by renaming the Russell Senate Office Building after him. McCain's office was in the beaux-arts style building, on Constitution Avenue, and it's where the committee he proudly chaired, the Senate Armed Services Committee, meets. It might seem like an odd proposal — after all, Richard Russell was a Democrat who represented Georgia in the Senate for 38 years and who was dubbed a "senators' senator" for his mastery of the chamber's arcane rules and procedures. Schumer's proposal would replace a fellow Democrat's name with a Republican's. 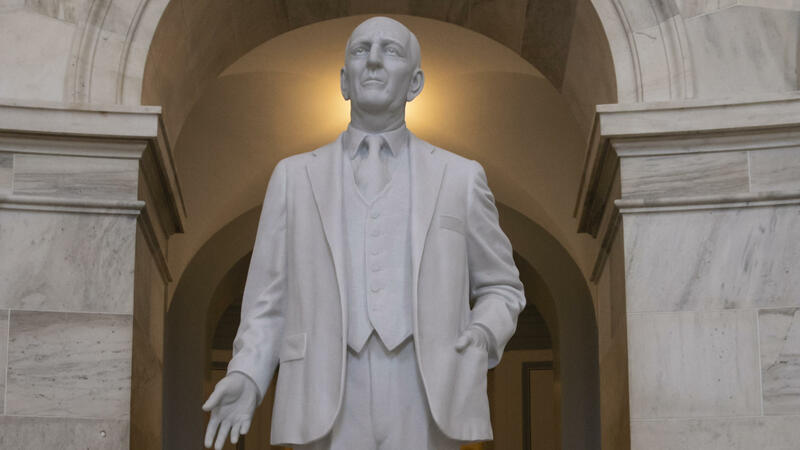 Russell's legislative accomplishments were many: He backed the New Deal in the 1930s; authored the National School Lunch Act, which provided meals for low-income students while also subsidizing the nation's farmers; and ardently supported the military. But Russell has another legacy, one that resonates even more in this era when statues honoring Confederate war soldiers and generals have been toppled on college campuses and removed from town squares: Russell was a staunch segregationist, and he used his same mastery of the Senate rules to block civil rights legislation, even keeping an anti-lynching statute from becoming law. He fought integration in the nation's military and at federal government agencies. In 1956, Russell was a co-author of the "Southern Manifesto," which opposed desegregation of public places, and he led the Southern bloc of senators who opposed the Civil Rights Act of 1964, calling it "shortsighted and disastrous." Russell even went so far as proposing legislation that would encourage African-Americans to move out of the South. Should one of the Senate's three office buildings, in the shadow of the U.S. Capitol itself, continue to bear Russell's name? Until it was named for Russell in 1972, the marble edifice had been known simply as the Old Senate Office Building, and in recent years other proposals have been made to rename it, including after the late Sen. Ted Kennedy following his death. Schumer, in a statement, said, "The Senate, the United States and the world are lesser places without John McCain." Schumer said he would introduce a resolution to rename the Russell building after McCain "so that generations remember him." It's unclear whether the resolution will win the backing of Senate Majority Leader Mitch McConnell.